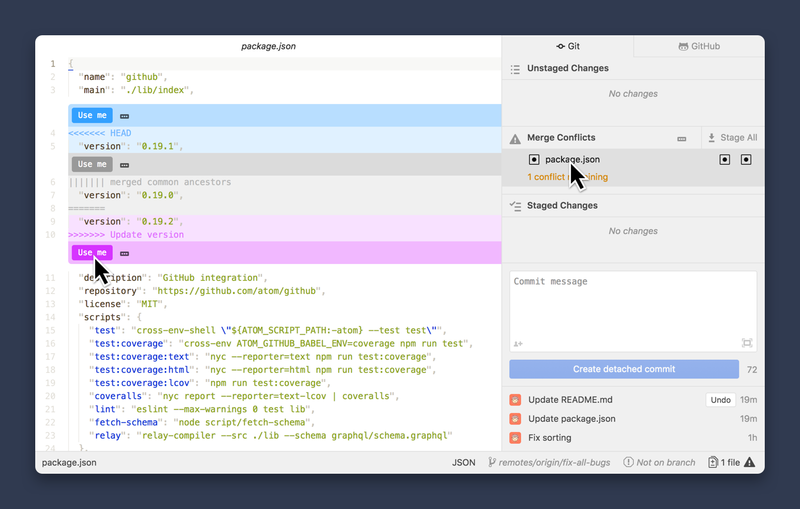 The github package brings Git and GitHub integration right inside Atom. Most of the functionality lives within the Git and GitHub dock items. In case a project doesn't have a Git repository yet, you can create one from the Git panel. To clone a repository, run the GitHub: Clone command. In the dialog paste a URL of a repository and click "Clone". A new project will get added to the Tree View. To open the branch tooltip, click the branch icon in the Status Bar. From there you can to create or switch branches. All changes: Click the "Stage All" button in the "Unstaged Changes" bar. Files: Double-click a file or select a file and press Enter. Hunk: Click on the "Stage Hunk" button or select a hunk and press Enter. Lines: Click on a line (or drag on multiple lines) to select, then click on the "Stage Selection" button. Or use the Cmd-/Cmd-/ key to toggle from hunk mode to line mode, then press Cmd-EnterCtrl-Enter to stage just a single line. Use the Cmd-LeftCtrl-Left or Cmd-RightCtrl-Right arrow key to switch between file list and the diff view. Unstaging can be done in the same way. If you no longer want to keep some changes, you can discard them. It's similar to staging, but accessible behind a context menu. All changes: Click the ... menu in the "Unstaged Changes" header and choose "Discard All Changes". Files: Right-click a file (or multiple) and choose "Discard Changes". Hunk: Click on the trash icon in the top bar of a hunk. Lines: Right-click on a line (or multiple) and choose "Discard Selection". 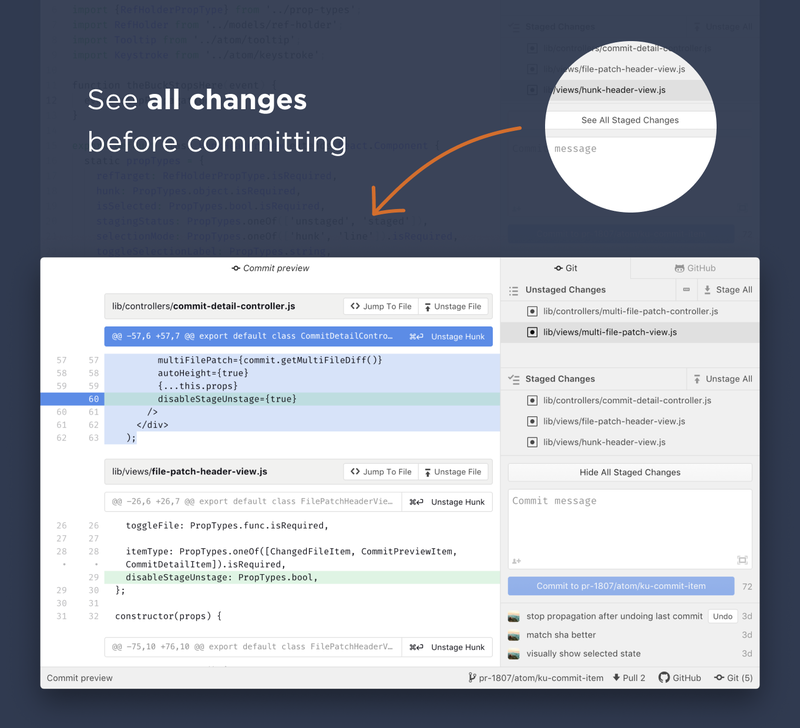 To double check all changes that are going into your next commit, click the "See All Staged Changes" button above the commit message box. 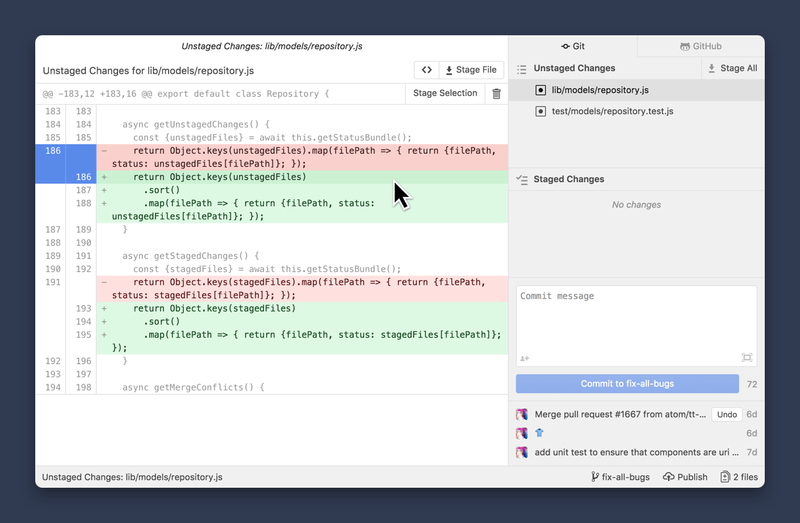 It lets you see all of your staged changes in a single pane. This "commit preview" can also serve as an inspiration for writing the commit message. Once you've staged your changes, enter a commit message. Feel free to describe the commit in more detail after leaving an empty line. Finalize by clicking the Commit button. If you need more space, click the expand icon at the bottom right. It will open a commit editor in the center. To add multiple co-authors to a commit, click the "👤➕" icon in the bottom left corner of the commit message editor. Now you can search by name, email or GitHub username to give credit to a co-author. In case you forgot to commit a change and would like to add it to your previous commit, right-click on the last commit, then choose "Amend" from the context menu. If you want to edit the commit message of your last commit, or add/remove changes, click on the "Undo" button. It will roll back to the state just before you clicked on the commit button. When you're ready to share your changes with your team members, click the Publish button in the Status Bar. It will push your local branch to the remote repository. After making more commits, you can Push them as well from the Status Bar. From time to time it's a good idea to click on the Fetch button to see if any other team member pushed changes. If so, click on Pull to merge the changes into your local branch. Learn more about merge vs. rebase. Sometimes there can be conflicts when trying to merge. Files that have merge conflicts will show up in the "Merge Conflicts" list. Click on a file to open the editor. There you can resolve the conflict by picking a version or make further edits. Once done, stage the file and commit. When your changes are ready to be reviewed by your team members, open the "GitHub" panel Ctrl+8 and click on Open new pull request. It will open the browser where you can continue creating a pull request. If commits haven't been pushed or the branch isn't published yet, the GitHub package will do that automatically for you. Once the pull request is created, it will appear under Current pull request at the top of the panel. Underneath is a list of Open pull requests. It lets you quickly find a pull request by avatar, title or PR number. It also lets you keep an eye on the CI status. 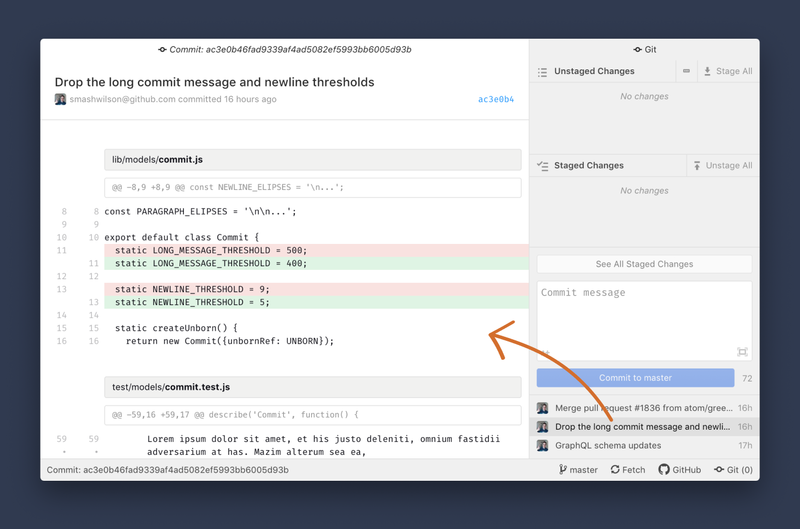 Clicking on a pull request in the list opens a center pane with more details, the timeline and conversations. You can open issues or pull requests from any repo on GitHub. To do so, run the GitHub: Open Issue Or Pull Request command and paste the URL from an issue or pull request. Then press the Open Issue or Pull Request button and it will open a center pane. This lets you keep an issue or pull request as a reference, when working in another repo. 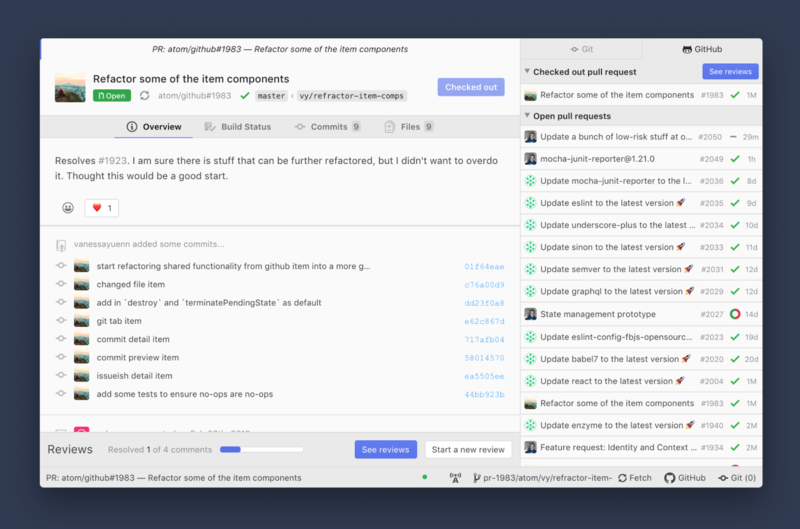 To test a pull request locally, open it in the workspace center by clicking on the pull request in the "open pull requests" list from the GitHub tab, then click on the Checkout button. It will automatically create a local branch and pull all the changes. If you would like to contribute to that pull request, start making changes, commit and push. Your contribution is now part of that pull request.